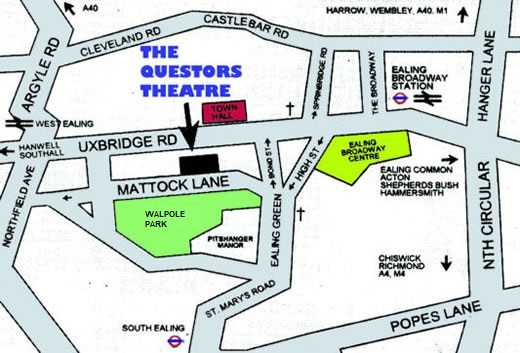 We are at 12 Mattock Lane, Ealing W5 5BQ. The theatre is an eight minute walk from Ealing Broadway station (on the Central and District lines, and also national rail) and about 15 minutes' walk from South Ealing station (Piccadilly line). Bus routes 83, 207, 427, 607 stop by the Town Hall, routes E2, E7, E8, E11 stop on New Broadway, and route 65 stops on High Street - all 3 or 4 minutes' walk away from the theatre. The following public parking information is accurate to the best of our knowledge, but please check local authority signs before leaving your car. We have a small car park for visitors to the theatre, and there is also free public parking after 7.00pm opposite us on the south side of Mattock Lane, along Walpole Park (but there are parking restrictions immediately outside the theatre).